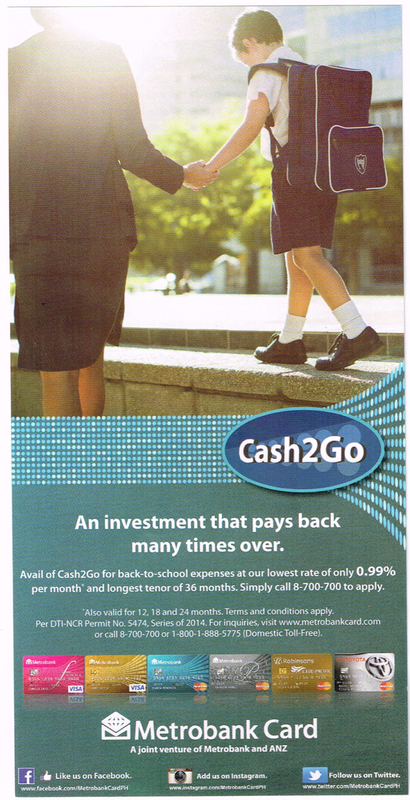 Avail of Cash2Go for back-to-school expenses at our lowest rate of only 0.99% per month* and longest tenor of 36 months. Simply call 8-700-700 to apply. All Metrobank Peso Visa/Mastercard Classic/Gold, Femme Visa, Platinum, World, Robinsons-Cebu Pacific, Go! and Toyota MasterCard principal and supplementary cardholders are entitled to avail of the Cash2Go Installment Program. To avail, cardholders must contact Metrobank Card Corporation’s MCC Customer Service Hotline at 8-700-700 (Metro Manila) or 1-800-1-888-5775 (Domestic Toll-Free). All applications are subject to MCC’s credit evaluation and approval. For approved Cash2Goapplications, proceeds will be released in three (3) business days through cardholder’s existing MBTC CA/SA account only. Not applicable to corporate, time deposit and Dollar accounts. Proceeds released through issuance of a Manager’s check will be made payable only to the name of the principal/ supplementary cardholder availing of the Cash2Go Installment Plan. Check will be delivered within seven (7) business days from date of approval. A transaction fee of Php 100 shall be charged for proceeds to be deposited to a non-MBTC deposit account or for checks delivered to the billing address. Funds will be transferred in seven (7) business days from date of approval and will be reflected to the cardholder’s next statement of account. The total installment amount inclusive of the total interest amount must not exceed the principal cardholder’s available credit limit at the time of application for the Cash2Go Installment. If the Cash2Go applicant is a supplementary cardholder, the Cash2Go’s total installment amount must not exceed cardholder’s monthly spending limit. Once the Cash2Go installment amount has been approved, the principal amount (inclusive of interest charges and fees) will be earmarked against the cardholder’s available credit limit. A monthly interest rate based on prevailing rates will be levied on the amount applied for installment. The interest is computed by multiplying the principal amount with the monthly interest rate multiplied by the chosen payment term. The Monthly Amortization is computed by dividing the Total Amount Payable (Principal plus the Total Interest Rate) with the chosen payment term. The fixed monthly installment amount, which depends on the term chosen by the cardholder, shall be posted to the cardholder’s monthly Statement of Account. The monthly installment together with the cardholder’s other transaction, if any, will form part of the cardholder’s Total Amount Due and will be included in the computation of the Minimum Amount Due for each statement cycle. Should the cardholder decide to pay only the Minimum Amount Due or any amount below the Total Amount Due, only a portion of the monthly installment amount due is considered paid. The entire remaining principal amount will be billed with the corresponding interest charges. The unpaid portion of the monthly installment amount due shall be included in the revolved amount that will be carried over to the next statement period and thus shall be subject to the regular finance charge. The cardholder agrees to settle the monthly amount due which shall be billed monthly through the Statement of Account. In case of partial amortization payment(s), the amount due under this contract shall be given last priority in the application of the said partial payment(s). Amount paid after date shall be charged with interest and penalty charges similar to that charged to other past due accounts. Failure to pay any monthly installment when due shall constitute default, in which event, the remaining balance shall immediately become due and demandable without need of demand. Should the cardholder accelerate the payment and cancels the installment contract with MCC, with or without advice, a pre-termination fee of P500 or 5% of the installment principal balance, whichever is higher, shall be billed to the cardholder. Any remaining balance (i.e. remaining principal amount based on Diminishing Balance computation and/or penalties, interest and other charges) shall be billed in the next statement cycle together with the applicable interest charge. Approved Cash2Go applications shall not be eligible to earn rewards points. All other terms and conditions governing the issuance of MCC credit cards not inconsistent with the foregoing terms and conditions shall be incorporated hereto. Also valid for 12, 18, and 24 months. Per DTI-NCR Permit No. 5474, Series of 2014. For inquires, visit www.metrobankcard.com or call 8-700-700 or 1-800-1-888-5775 (Domestic Toll-Free). hi po .nagavail po ako ng 11k for 18months...pwedeng mg advance payment para hndi n umabot ng 18 months ung pagbabayad ko?? Hello po. Pwede po bang mag avail? Hindi po kasi ma contact yong toll free number nyo. Ask lng po nagavail kc ako last december ng 20k on going payment p din ako till dec '17 ok lng po b magaapply ulit ng loan in additon to my current c2g? isang buwan na ako simula nag apply ako ng cash to go pero daming reason kung bakit di napadala at di naideposit. nasgsisi ako kung bakit nag avail pako neto... di ko pa natanggap ang pera tapos nag interest at may charges pa...kaya kayo jan hinay2 kayo sa mga eto. Would like to ask if how many days po yung pag transfer ng funds to non Mbtc CA/SA? nagbavail po kasi ako ng Cash2go thru phone noong Sept.9, 2017 and approved on Monday Sept.11 and nag charged na po yung na loan ko sa CC ko on that day. Until no Sept. 16 wala pa pong pumasok na cash sa account ko po. Want to know what happened po and were u able to receive the cash? di po gumagana yung toll free nyo po, ano po ba contact number sa cebu dito? Wag nyo po palampasin ng 6 months, baka maging stale cheque. Napaka-bagal ng process! June 5 pa na approved, anong pecha na po. Ang reason ng delay mali ang nalagay na name sa cheque! So next time make sure na tama yung name na ilalagay sa cheque.dali kausap pag mag rerequest pero pag process na nag bagal! Wala mqn lang verification ng name kung tama ba spell or kung complete ba basta lqng process napaka-hassle iccredit na sakin sa june 28 ung monthky charge nito pero dko pa nakukuha! Ang dami process mag papa-palit pa ng pangalan! Magagaling magdeduct pero ang bagal mqg release! 90% ng credit limit mo ang pwede mong cash 2 go.. 3 days processing yan..
Hi.. kelangan ba talaga mag create ng checking account o kelangan me savings account kana para mareceive yung loan? Di ba pwede padala nalang yung cheque? depende kung anung easiest way namarerecieve mo agad ang pera mo.. pwedeng check account of thru ATM..
Tawag ka lang sa Metrobank hotline po..
Sir 3 days po ang processing niyan. After ninyo makausap ang customer service. Basta ATM account ang gamit. Parang wala ata nakalagay na pwede mag avail online. Is there anyone here who can please explain the Charges? Sabi sakin ng agent na nakausap ko, 1342.28 ang monthly charges ko for 24 months, pero ang 1st bill ko is 1543.32. Para saan po yung 201.04? Punta lang po kayo sa metrobank site po.. or google search ninyo ang metrobank cash2go computaion.. dun o ninyo makikita ang actual computation po.. ag may discrepancy.. tawag ninyo sa hotline nila.. There is an additional of 200 pesos once you applied c2g thru fon. 100 pesos for processing fee and 100 for approved transaction done thru fon call.. I am planning to avail. Which is better, thru Customer Service po or directly sa branch? Kasi nabasa ko ibang reviews na matagal ma credit sa account and hassle. E pag sa branch daw within the day. Thanks. Di ko pa po na try mag avail directly sa branch. more credit lang po ako. within 3 days pumapasok po ako agad ang pera basta expect mo 4 days para sure po..
Mabilis lang ba sya? May cc ako ng metrobank din..
San po ipapadala nun yung pera thru cheque ba siya ibibigay kung gamit ay credit card? buo nyo po ba nareceive ung pera?sakin kasi may bawas n imbes n 10k 8400 lng natanggap ko..
Uu naman buong amount walang bawas po.. kung 10K ang loan ko. 10K rin marereieved ko..
Gusto kung mag avail ng cash to go may account naman ako sa Metro bank, pero ang credit card ko ay mag 2 Months palang, possible po ba? Pagkatapos ma approve mag notify ba sila pag pumasok na yung pera sa atm? Hindi po ako makapasok sa hotline nyo. Nag apply po ako ng c2go last Oct. 19 until now wala pa rin, na charge na sa credit card ko, anong petsa na bah, akala ko 10 working days lang. Hi 90% of credit limit un pwede i loan sa cash to go? How about if there is maintaning balance un CC, ndi ba mkkpag loan ng 90% ng credit limit? i wan to avail of the cash to go ng metrobank pero bkit d makakonek ang tawag.ano dapat gawin? Hello po , may nag tawag sakin po ditu kung e avail ko po ba yung naiwan sakin na balance sa credit card ko po , tapos inavail ko po sabi ipapadala lang daw thru cash to go . Tapos bakit po til ngayun wala pdin ? Nag open nadin aku ng saving account ko para dun na maideposit yung cash na sana mapadala ditu . Mga ilang araw po ba talaga mareceived ko yung cheke ? hi. kaka-activate lang ng credit card ko. kumuha ako ng credit card dahil nabasa ko meron po kayo nitong cash to go. gusto ko sana mag avail ng 50k for 36 months for my shop. possible po ba yun? thank you. Maka avail po ba nito kahit hindi metrobank holder?